Latest on the snow cannons in La Tania: They are now all installed and connected up to the new reservoir next to the 4-man Lanches chair lift - at the top of the La Tania Gondola. There are 38 snow cannons of the latest very high pressure type installed all the way down the Folyeres blue run to the resort centre. 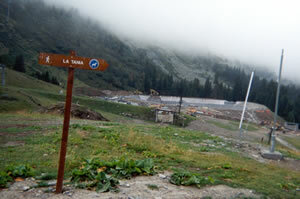 The picture below shows a new snow cannon with the reservoir in the background. The drag lift bridge is shown where you would normally ski under towards the 4-man chair after ascending the gondola. The view above is as you walk out of the top gondola station. 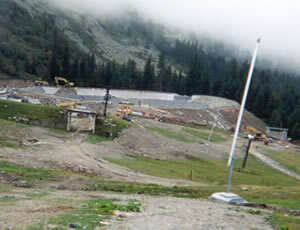 The reservoir is just about completed and was built to the side of the piste so it doesn't affect the skiing too much. It'll look a lot better when they've finished the landscaping and everywhere is covered in snow! Water is drawn from the bottom of the reservoir - the top is frozen and a mechanism to send bubbles up from the bottom to prevent the rest freezing is used. Once Winter arrives no more water will fill the reservoir as the top and all surrounding streams will be frozen. Let's hope for plenty of rain before December! Lift Passes: A 6 day Adult Three Valley pass will cost 1193F next season (now in Euros of course at 182€). 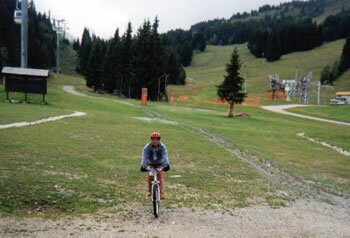 The 6 day Adult Courchevel / La Tania Valley pass is 970F (it's still around 10F to the pound). Extension to upgrade to a 3 Valleys pass for one day costs 112F and to extend a 5 days or more pass for one extra day costs 164F / 138F. A one off 1 day pass costs 243F / 203F. Season prices are 5346F for the Three Valleys and 4362F for Courchevel / La Tania. Full price list will be up soon. New Ski Lifts:There are 2 new 6-man chairs in Courchevel and 4 new lifts in VT / Les Menuires including a covered chair and a new Funitel. In Courchevel 1850 the Pralong drag lift has been replaced by a 6-man high speed chair which arrives next to the top of the Biollay 4-man chair. A large new unloading area has been landscaped here and the short Super Pralong drag has been removed. There'll probably be a new piste down there towards the Suisses 4-man chair (used to be a favourite spot to get freshies after walking behind the Pisteurs hut - oh well). In 1650 the long Grandes Bosses parallel drag lifts have been replaced by another 6-man high speed chair which runs up to the top of Signal. There are 2 new chair lifts in Val Thorens in the Fourth Valley (with 3 new runs) and a new Funitel (jumbo gondola) replaces the Fonds 2 chairlift right up to the ridge giving another point of access to the Fourth Valley. Les Munuires sees a new high speed covered chair taking you out of the resort centre right up to the ridge above Mottaret at 2850m. New Lifts rumoured for 2002/2003 Season (not confirmed): A 4-man chair is to replace the Creux and Fruit drags (the really steep ones next to Aiguilee du Fruit chair) on the way back from 1650. In the Meribel Valley a new 6-man high speed lift replaces Plan des Mains chair. This is the slow "magic carpet" chair at the base of Mont du Vallon which links back to Mottaret (also used on the way back from Val Thorens). Finally, a gondola out of St Martin de Belleville is to replace the 3-man chair. A new beginners area will be created and the village drag lift will be moved to the edge of the piste and made less violent! Is this the oldest lift in the 3 Valleys? More Building Work: The second Mountain Centre chalet is now up and there's the usual amount of building work going on around the resort. A few more new chalets are being built and another Estate Agent on the main road coming in to La Tania is being constructed. There's a lot of piste reshaping, landscaping and erosion control work going on near the top of Chenus, right above 1850 - could this be the Boarder-X park that was rumoured last season?